The Lyminge project team are happy to announce the arrival of two key publications – one academic and the other aimed at a public audience – off the back of another highly successful excavation season in summer 2013. The first, by Project Director, Dr Gabor Thomas, published in the current volume of the Antiquaries Journal, provides a detailed synthesis of excavations between 2008 to 2012. The paper assesses and contextualises the results in a chronological framework emphasising Lyminge’s capacity to provide new insights into how the founding of monasteries in Anglo-Saxon England redefined a pre-existing stratum of central places embedded in the power structures of the pagan past. The second article, by Project Post-Doctoral Research Assistant, Dr Alexandra Knox, has just appeared in the latest edition of Current Archaeology magazine. 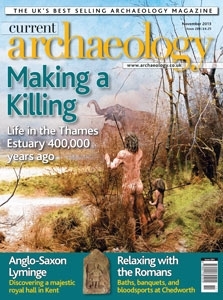 While revealing more details concerning the remarkable Anglo-Saxon feasting hall discovered in 2012, the article also takes the opportunity to highlight the community dimension of the Lyminge project and key discoveries dating from the prehistoric and medieval periods.